Refreshing Daily in God's Word: Daily Devotion: Where Is the Daubing? 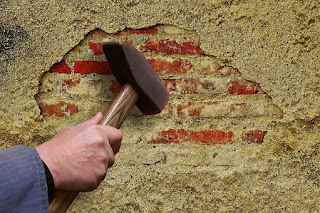 Key Verse: Verse 12 – “Lo, when the wall is fallen, shall it not be said unto you, Where is the daubing wherewith ye have daubed it?" Daniel Webster said: “If religious books are not widely circulated among the masses in this country, I do not know what is going to become of us as a nation. If truth be not diffused, error will be. If the evangelical volume does not reach every community, the pages of a corrupt and licentious literature will. If the power of the Gospel is not felt throughout the length and breadth of the land, anarchy and misrule, degeneration and misery, corruption and darkness, will reign without mitigation or end.” These words of a century-and-a-half ago had a strangely prophetic ring. (Source Unknown). ✞ We often hear, “Let freedom ring.” But freedom will only ring as we shout out the Truth.